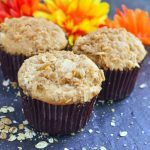 If you're looking for an easy applesauce muffin that is filled with flavor this is it! We use applesauce and fresh apples in this applesauce muffin recipe. In a large bowl mix the flour, baking powder, salt, pumpkin seasoning and cinnamon. Once combined add in the applesauce, vanilla, milk, sugar, and stir until combined. Fold in the apples and then place into a muffin tin. Mix streusel ingredients and top muffins.